It’s the moment we all hope to have once in a while. I sat in the middle of a beige winter field on a canvas director’s chair. Closing my eyes and turning my face to the warmth of the sun, the January breeze wisps surrounded me. Most of the time, I try not to let myself sit and love to keep moving toward something – anything. There’s something about ruminating about cancer too long that makes me want to curl back into a hospital bed strung up like a puppet to machines, but last Saturday I did the opposite. My friend D is incredibly sentimental, but more than that she’s empathetic. Before knowing me, she prayed for me as I was going through treatment. She cried a sister’s tears when I came to her house for the first time and peeled off my gray chemo hat, unveiling a naked scalp. Like a family member, she never complains when I find her good snacks in the refrigerator and chomp on her precooked bacon during small group. But more than anything, God’s gifted her with the precious gift of seeing truth. Whether it’s through her camera lens or in person, she can tell you if you’re trying to fake it until you make it. So when I needed new pictures for Teal45 and post chemo, D was more than an obvious choice. We were both thrilled for the shoot, and D kept calling and texting and Pintresting and Facebooking what ideas she had for the shoot and how excited she was to do it. On Saturday morning, D and I were both on a husband and children time clock, knowing that sooner or later they would need us. I got dressed to take a few in casual clothes instead and a few formal on D’s tailored teal couch. We chatted between takes and finally headed back outside for some more. Winding behind the houses, there was a field of tall grasses, a great grey tree on its side, and the city’s power lines stretching into the background. I loved being outside, and the position of my body or the symbolism of the open sky or how well the pictures turned out were in false compare to how I felt. D kept telling me to remember how free I was from cancer, how I was God’s daughter, and to soak up all His goodness in the rays of the sun. Receiving encouragement and having someone remind me of God’s faithfulness was immeasurable. I felt it. I remembered it. I embraced it. This was the moment we all hope to have once in a while. I inhaled all the freedom and let the glory rest on my face. I exhaled thankfulness for being able to see another sun come up. I closed my eyes in reverence because I cannot even pretend to see what God still has in store. 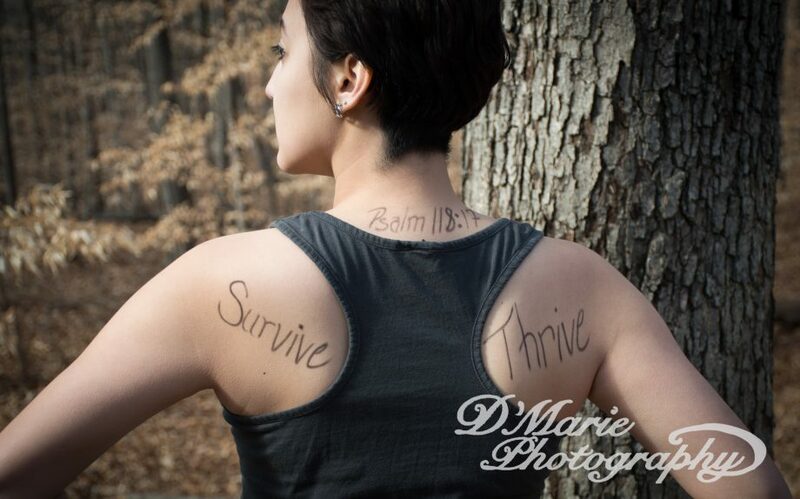 This entry was posted in cancer, chemotherapy, Christianity, faith, life truths, marriage, ovarian cancer, recovery, writing and tagged cancer, chemo, discover, faith, friendship, inspirational, ovarian cancer, recovery, survival. Bookmark the permalink. Amen! And the picture looks beautiful. She did great!